LAWRENCE — University of Kansas graduate student Angelo Andres, along with his mentor Blake Peterson, Regents Distinguished Professor of Medicinal Chemistry at the KU School of Pharmacy, has earned a prestigious Gilliam Fellowship from the Howard Hughes Medical Institute (HHMI). The award of $50,000 is renewable for up to three years and is awarded to support promising graduate students from diverse backgrounds who will work as teams with their individual advisers to build inclusive training environments. The fellows’ mentors will also participate in a year of professional development activities aimed at increasing the number of students from underrepresented backgrounds in the sciences, including online training and in-person workshops at HHMI headquarters. “Effective mentoring is crucial for supporting the growth of a student’s research and professional skills, and every student currently in the mentor’s lab, and every future student, can benefit,” said David Asai, senior director for science education at HHMI. Andres is grateful to HHMI for the opportunity to continue training with Peterson but also to pass on what he has learned to others in the lab. “I was thrilled to learn that I was being awarded a Gilliam Fellowship from HHMI. In addition to funding my research and career development as a scientist, this award also gives me the opportunity to mentor undergraduate students, especially those underrepresented in STEM disciplines,” Andres said. Andres arrived at KU after serving in Afghanistan as a member of the U.S. Army. It was there that he first seriously contemplated the importance of surrounding himself with people from a wide variety of backgrounds and ethnicities. Working alongside soldiers from various places such as Eastern Europe, Southeast Asia, Afghanistan and the Middle East, Andres was inspired to find creative ways to communicate and, as a result, learn more about his partners as they worked toward their common goal of preventing the spread of infectious disease. Peterson has seen firsthand how Andres has used his experiences not only to improve himself but also those around him. “As a veteran, McNair Scholar, and the first in his family to obtain a STEM degree, Angelo has used his personal experiences to inspire other students from similar backgrounds to pursue the biomedical sciences. He is a leader with creative ideas that move our research in new directions, and he actively encourages others to follow in his footsteps with his enthusiastic attitude and generous demeanor,” Peterson said. 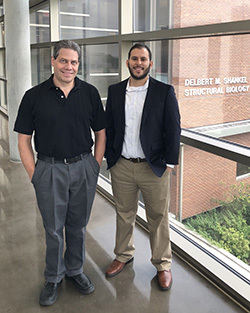 Andres and Peterson are designing experiments to better understand fundamental signal transduction pathways by creating artificial cell surface receptors that span plasma membranes of living human cells. Current methods of studying receptor-mediated signal transduction pathways involve genetic modifications that can be difficult to utilize in some cell types. Andres’ graduate work is focused on producing transformational chemical tools for studies of cellular signal transduction, involving mimicry of key features of receptors that control cellular growth and death pathways. Development of these tools could provide biomedical researchers with a novel platform to study signal transduction pathways involved in numerous diseases. This is not the first time that KU has partnered with HHMI to support education in the biological sciences. KU is a member of HHMI’s Science Education Alliance (SEA), and KU students and faculty mentors have been selected for competitive awards under both the Exceptional Research Opportunities Program (EXROP) and the Phage Hunters Advancing Genomic and Evolutionary Science (SEA-PHAGES) program; Robert Ward, associate professor of molecular biosciences, secured this competitive designation for KU and now runs the SEA-PHAGES program for undergraduate biology majors. “Angelo and Blake are to be congratulated. While there’s still work to be done, this fellowship opens doors and helps KU build a pipeline to draw even more students, particularly those from underrepresented groups, toward excellence and leadership in the life sciences,” said Jennifer Hamer, vice provost for diversity & equity. Andres also underscores what this award will mean to his future career as a scientist and a mentor. “Throughout my scientific training, I have been fortunate to have great mentors every step of the way. As a Gilliam Fellow, I know that I will also have an opportunity to learn the best ways to mentor others who come from diverse backgrounds, and I hope to develop a culture of inclusivity for all students as I work to pass on my experience and train the next generation of scientists,” Andres said.